They ship flat so there is no need to iron them out, a major complaint with the competition. I offer 2 sizes. Why spend more than you need to? Most dogs know which side of the door opens and never bother the side with the hinges. For these dogs, the standard size of 32” x 16” is designed to cover about half the door, below the knob. If you only need half of the door protected, please go to the Standard Door Shield page. For dogs that scratch the entire bottom of the door, or families with multiple dogs, I offer a double-wide 32” x 32” shield. The double-wide is a bit more expensive than purchasing 2 of the standard sizes. This is to cover the extra shipping costs involved in shipping a package that is twice as large. Standard size is 32"H x 16"W to cover a large area of your door. Double-wide size is 32"H x 32"W to cover a large area of your door. As soon as I began selling window sill protectors, customers asked me if I also had something for doors. I looked around and found that unlike a window sill protector, there was an existing product for doors. I ordered it thinking that if I liked it, I’d find who made them and see if I could add it to my product line. As soon as I opened the box, I knew a rolled up, purplish sheet was not something I would want associated with my high quality Sill Shield. My door shields are made of PETG, the same strong & clear material used in water bottles but much, much thicker. Unlike others, its not a film but a rigid sheet. You can trim this shield yourself with a sharp scissors, but I do offer some custom products including making strips to cover the molding around the door and drilling holes for knobs or locks, so the shield can be mounted higher. No one stands behind their products the way I do. As long as I’m alive, they’re guaranteed - when I’m gone you’re on your own. If you dog scratches through any of my shields, just send it back and I’ll send you a new one. If you have a good, sharp scissors, you can trim the shield. If you need a hole for a door knob, so that the shield can be mounted higher and go above the knob, just let me know and I’ll be happy to take care of it for you. Some door trims are too curved or ornate to provide a good mounting surface for a shield. If you are interested in a strip for a molding, please contact me first at [email protected] I might have a scrap piece that will do the job. If not, you’ll have to either buy a second shield or trim a strip out of the shield you purchase. Wow, this door shield really is awesome. I tried others without success. This shield covers the entire lower portion of the door and lays nice and flat. The coins used to attach the shield to the door are far superior to anything I've ever seen and really hold it in place. I will always turn to Sill Shield for my dog shield needs. We combined the double wide door shield with the heavy duty Claw Guard which hangs from the door knob to provide complete protection ! Claw Guard was not wide enough and our dog still tried to get at the door jamb through the guard's edge. 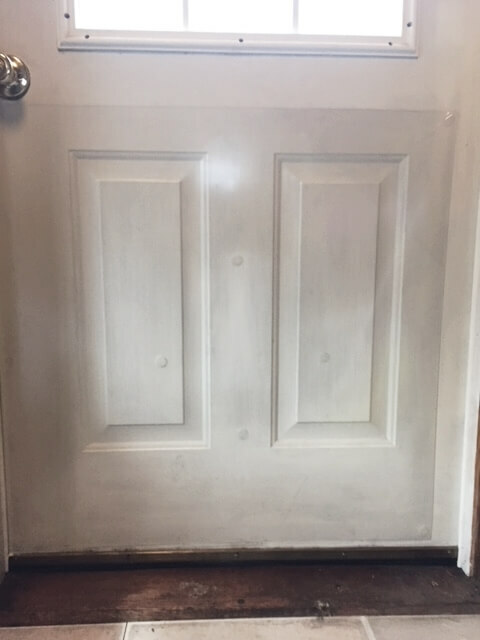 We attached it with velcro strips to the double wide door shield and now the entire lower half of door and jamb is protected from scratching- visually a lot better than looking at scratches and making repairs ! These door shields are sturdy and aesthetically pleasing. They protect our wood doors from the strength of our 120 pound Bernese Mountain Dog’s scratching, his way of getting in and out of rooms. Our contractor was so impressed he asked for the website for future projects. I have a 90+ lab who only scratches doors to get in, I was hopeful about this product but didn’t have many expectations as all the door guards have been awkward and expensive. This piece truly has weathered his scratching with no issues at all! As well, the door has handled PNW weather!